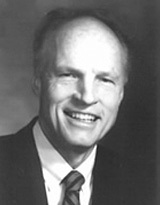 Truman G. Madsen (born in 1926,died 2009) was a philosopher, essayist, teacher, biographer, and a faithful member of The Church of Jesus Christ of Latter-day Saints (Mormon Church). He was married to Ann Nicholls Madsen in 1953, and they had three children and a Navajo foster son. He was emeritus Professor of Philosophy at Brigham Young University, and was Director of the Jerusalem Center for Near Eastern Studies in Jerusalem. He held the Richard L. Evans Chair in Religious Studies at B.Y.U. He has been guest professor at Northeastern University, Haifa, and Graduate Theological Union in Berkeley, California. He sponsored several symposia on comparative religion published as Reflections on Mormonism, The Temple in Antiquity, and Chosenness and Covenant in Judaism and Mormonism. Truman G. Madsen wrote and spoke on an astonishingly wide range of topics about the Restored Gospel. Born in Salt Lake City, he was a grandson of Heber J. Grant. In his youth he served in the New England Mission under Elder S. Dilworth Young. Later, at the age of 35, he was called to preside over the same mission where he had earlier served as a young missionary. His academic studies in the history of ideas, and particularly of philosophy, took place at the University of Utah, University of Southern California, and Harvard University. Throughout his adult life he studied the life and teachings of the Prophet Joseph Smith, and thrilled countless audiences as he shared many of the insights gained from the Prophet’s teaching. During his life Truman G. Madsen served in many positions in the Mormon Church, such as counselor in the Ensign Stake genealogical committee, counselor in the Atlantic district presidency, bishop of the BYU 11th Ward, a member of the Deseret Sunday School general board, BYU 5th Stake President, and most currently patriarch in his stake. Much of his success was due to his personal appeal. Though as a boy he and his two brothers were vigorously grilled by his father in the arts of language and presentation, he was blessed with an ideal speaking voice and a "sparkling personality." He had a nimble mind and a capacity to grasp profound issues and yet convey them to the comprehension on layperson levels. Virtually all of his presentations were extemporaneous, and he was a master of this dying art, which is now yielding to the teleprompter and PowerPoint. It will probably never be known how many people he touched and moved in areas ranging from casual to profound, but the number is large. His demand as a speaker began early in his career and remained intense through his life. He traveled all over the world to inform and inspire audiences about the exhilarating experiences associated with the gospel of Christ that invite our embrace. Some of Truman Madsen's publications are: Eternal Man, Christ and the Inner Life, Four Essays on Love, The Highest in Us, The Radiant Life, Five Classics, Joseph Smith: the Prophet, Defender of the Faith, a biography of B.H. Roberts, and On Human Nature. He is one of the editors and a contributor to the five-volume Macmillan Encyclopedia of Mormonism. The Church of Jesus Christ of Latter-day Saints lost one of its great orators and scholars with the passing of Truman G. Madsen on Thursday. The emeritus professor of philosophy at Brigham Young University and former director of the Jerusalem Center for Near Eastern Studies died at his Provo home after a yearlong battle with cancer. He was 82. Madsen was considered a philosopher, essayist, teacher and biographer. He was also a grandson of Heber J. Grant, seventh president of the LDS Church. He taught at BYU for 37 years. "I think Truman Madsen was one of the true pioneers in bringing intellectuals of other faiths into dialogue with Mormon thought even as he probed the philosophical richness of Joseph Smith's contributions for an LDS audience," said Terryl L. Givens, a University of Richmond professor of literature and religion. "At a time when Mormonism was still either ignored or considered too odd to take seriously, because of Madsen's personal relationships and the respect in which he was held by his colleagues he was able to really bring Mormonism into the orbit of a lot of religious and intellectual discussions at higher levels than it had been before." Madsen had a keen interest in Joseph Smith and helping "millions (to) know Brother Joseph again." In fact, his obituary begins with the words "Oh, Joseph!" "Truman Madsen was one of a kind," Sheri Dew, president and CEO of Deseret Book Company, said. "He not only spoke the language of the scholar, but he had the rare capacity to teach even the most complex concepts in a way that meant something to the rest of us." "Madsen's lectures were also a wonderful link back to an earlier, more oral Mormonism, one that placed a real premium on powerful preaching," Nathan B. Oman, assistant professor at the Marshall-Wythe School of Law at The College of William & Mary in Williamsburg, Va., posted on the Web site timesandseasons.org following Madsen's passing. Oman said Madsen provided "two or three generations of BYU students with a role model of a man who remained absolutely committed to the restored Gospel while at the same time willing to grapple with the hard questions of philosophy." Madsen was the patriarch in Provo's Sharon East Stake at his passing and even the younger generation, who may not have been aware of his scholarly accomplishments, were impressed with his charity. Kevin J Worthen, president of the Sharon East Stake, described him as a spiritual giant who loved people greatly. "He was just so loving and kind," Worthen said, stressing that many young people in his stake knew nothing of his career and simply knew him as a loving patriarch. Perhaps less well known, he was a master at Frisbee, an avid lifelong BYU football fan, and made the best scrambled eggs, popcorn, and lemon ice cream on the planet. He was a hopeless romantic and loved Rachmaninoff, Gershwin, and Grieg as well as Cyrano de Bergerac, "Random Harvest", and "An Affair To Remember." He loved relaxing at the cabin the family built at Brighton, eating at Cardullo's deli in Harvard Square, and walking the shores of the Sea of Galilee. He owned every recording jazz band leader Stan Kenton ever made and his youngest daughter's first sentence was, "Turn it down!" He is survived by his devoted wife, Ann Nicholls, and their three children: daughters Emily Reynolds (Mark), Mindy Davis (the late Grant Davis), and son Barnard (Cindy); a Navajo foster son, Larry Watchman; 9 grandsons, and 5 granddaughters; 2 great-grandsons and 10 great- granddaughters. A memorial service was held on Tuesday, June 2, noon, at the Provo Tabernacle, 90 S. University Ave., Provo. Watch a video about Truman Madsen's life. This page was last edited on 27 August 2010, at 21:29.